While our sweet girl is now gone, her impact on our breeding is so significant, we felt it was important to leave her in our main section about our breeding females! Her presence is definitely missed here! When the Schuler's announced they were getting out of the llama business, I immediately contacted Maggie and made arrangements to obtain Normandie and Bauernheim's Nina. Normandie had been an excellent top producer for the Schulers and has a wonderful pedigree. She is by *Union Jack and out of Rammas's Rapunzel who is a half sister to our Eagle through the sire Legend's Rammas. Normandie's crias usually weigh 35+ pounds and she has loads of milk. Her fiber is very fine and has great lock structure. Fabulous for grooming out and great for spinning! Over the years, Normandie has produced numerous show champions and her offspring reside in some of the most respected breeding programs in the world. Her daughter Bauernheim's Sofya, won the 1999 Western Regional Grand Champion Heavy Wool Female title and was nearly an ALSA Halter Champion when she was exported to Australia in 2000. Normandie also produced Bauernheim's Fireprince who is an ALSA Recognition of Merit and Halter Champion. 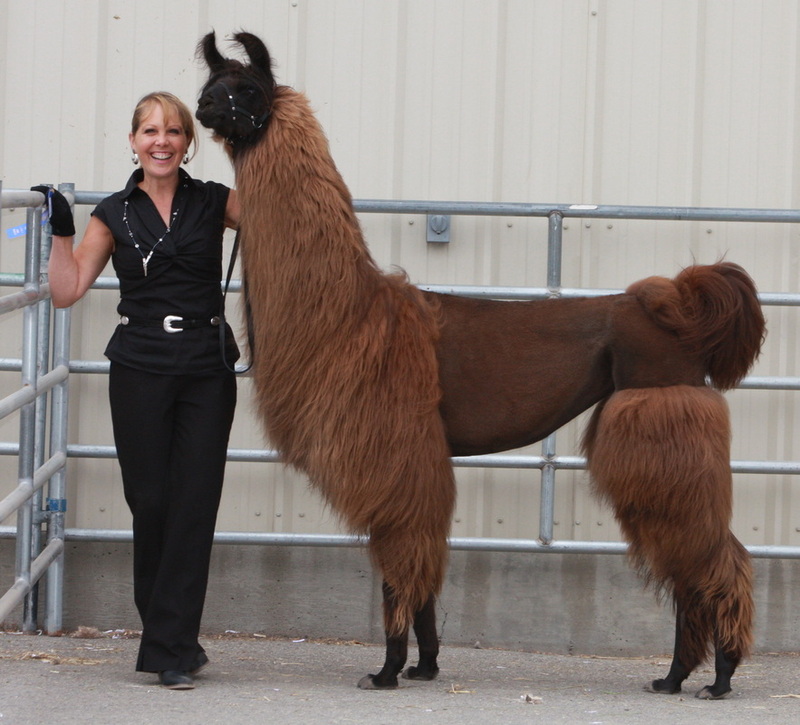 Her daughter Bauernheim's Serena placed first place and Grand Champion at nine months of age at the 2002 ALSA Hobo Show. Serena then went on to make top ten in her class at the 2002 Spring Celebrity Sale. Normandie's is also the dam to Bauernheim's Hershey Kiss, Bauernheim's Ruth and Bauernheim's Sienna. We sold her 2005 son to Tennessee to the Howks who were showing him and winning with his offspring. Her 2006 daughter went to Kentucky to the Carmichaels and was part of their breeding program. Her 2009 daughter, JNK Marisco's Venicia is owned by the McWhorters of Washington and has been cleaning up at shows in halter and performance. She is a finished ILR Halter Champion and almost one in ALSA. JNK Huaycool's Frisella was sold to David Armer of Nevada and won Best of Show at the California State Fair her second time showing and more recently in 2014. We had a gelded son of Normandie's, JNK Zumiez's Sirmione, who cleaned up in halter (finished ILR SD Halter Champion) here in the NW and was on the top of the 2011 ILR UAP top 10 list. Her 2011 daughter "Huaycool's Rosabella" is staying here at JNK. Rosabella finished all 6 of her ILR Halter titles in 5 shows and is an ALSA Halter Champion. Since then she has gone on to finish all of her ILR performance titles and finished the 2014 season as Overall Highpoint llama for the NW. 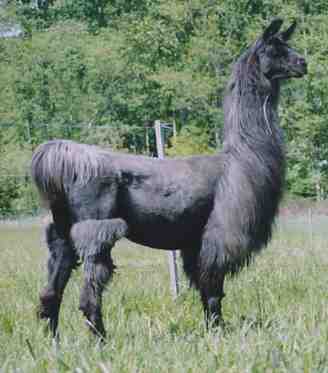 JNK Normandie's Gevalia (Normandie's 2012 girl by Marisco) is slatted to go to New Zealand to Serenity Park Llamas. Gevalia has all six of her ILR Halter titles and is being used for therapy work. She was also a 4H animal for two years. Normandie is the ONLY female in the United States to have two offspring sold out of the country for exporting. I had always suspected that Normandie had super fiber. After going through the training to become a fleece judge, I found that my instincts were correct. 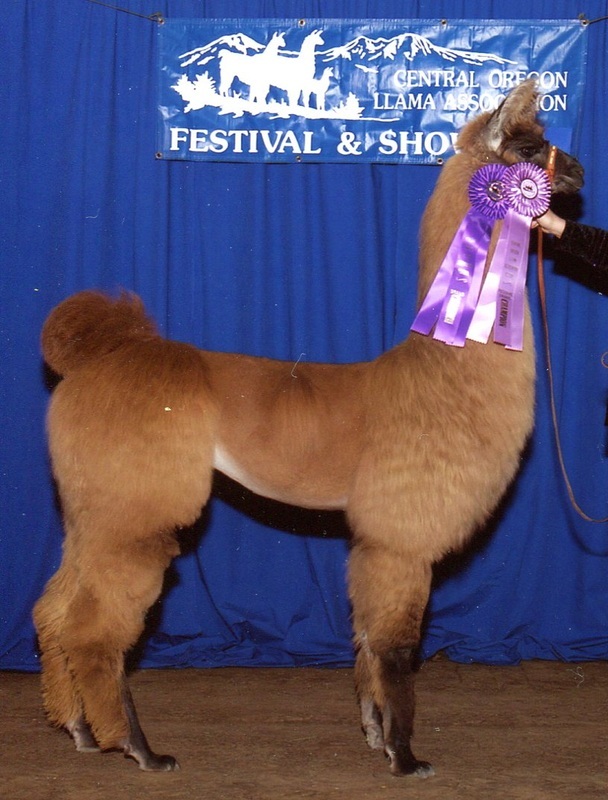 Normandie's grandson, Caramel Macchiatto (owned by Tracey Wallace of CA) was the 2008 ALSA National Suri Bagged Fleece Best of Show & Grand Champion. After spinning Normandie's son, JNK Marisco's Macchiato's (owned by Mike and Tori Howk of TN) fiber, I can tell you that it was the nicest fleece I have ever spun. This same male's daughter, FCF Macchiato's Lemany Kat has done exceptionally well in fleece classes and even won a composite class at the 2009 Camelid Extravaganza Show. This line has fine fiber, with density, luster and a wonderful hand. As the icing on the cake, Normandie has three daughters (Frisella, Rosabella and Gevalia) that are Complex Registerd Pet Partners Therapy Llamas. Everyone always asked me about this girl and her crias. They were always spoken for or sold in advance of weaning! After doing some research, we discovered that Normandie has a lifetime earning of over $56,000+ in offspring sales. Thank you to Tori Howk and Valarie Carmichael for showing Machi and Lotus for this title! Rosabella is an ILR-SD Performance Champion too! ALSA Halter ROM, Almost an ALSA Halter Champion!